James Pikul holds a sample of "metallic wood" in his engineering lab at the University of Pennsylvania. Titanium — the stuff of hip implants and aircraft parts — is strong and light. Aluminum is even lighter, but not as strong. In a lab at the University of Pennsylvania, engineers have created an improbable material that is as strong as titanium while putting aluminum to shame in the weight department. Called metallic wood, it is light enough to float in water. “It’s like a scaffold,” said James Pikul, an assistant professor of mechanical engineering and applied mechanics. So far, the engineers have made just small squares of the material — each about the size of a postage stamp — but they envision that it could be produced in large enough quantities to make rugged, ultralight exteriors for cell phones and other electronic devices. Depending on the cost, it might be an option for making lightweight, fuel-efficient cars. Magnified about 12,000 times, this ultralight "metallic wood" made at the University of Pennsylvania has the appearance of honeycomb or a sponge. What’s more, the pores can be filled with other substances, such as the chemicals needed to make a lightweight rechargeable battery, Pikul said. In fact, that is how the idea began. When Pikul was a graduate student and later a postdoctoral fellow at the University of Illinois at Urbana-Champaign, he and colleagues made powerful batteries out of similar materials without considering that they might be ultra-strong. Pikul had the idea to test their strength, and the early results prompted him to continue the research after coming to Penn in 2017. In collaboration with engineers at Illinois and the University of Cambridge, he published his findings in January in the journal Scientific Reports. The process for making metallic wood is sophisticated yet easy to describe. Start with billions of tiny plastic spheres suspended in a small vial of water. 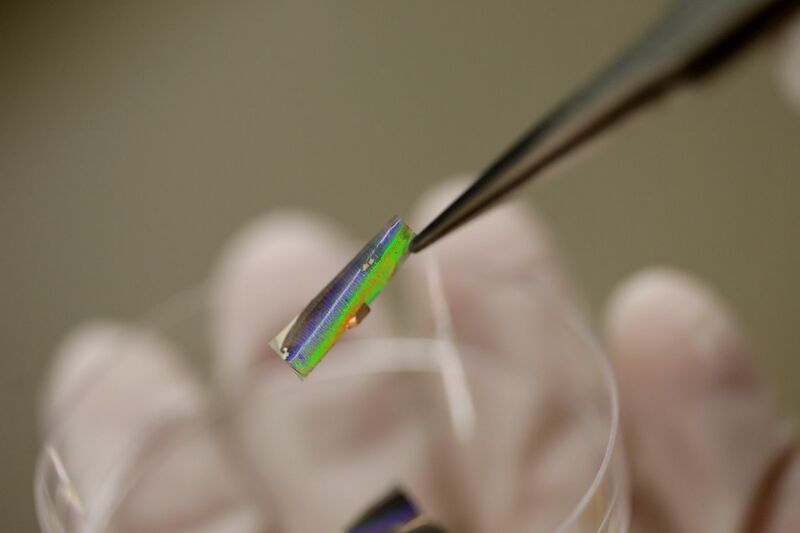 Insert a substrate — a strip of glass-like material that conducts electricity — and heat up the water. As the water evaporates, the spheres settle on the strip in an orderly pattern, stacking themselves almost like a pyramid of oranges in a grocery-store display. James Pikul, an assistant professor of engineering at Penn, describes how to make "metallic wood" in his lab. In his right hand, he holds a substrate that is used in the process. Then “electroplate” the spheres with nickel, much like chrome is used for plating shiny car parts. That means placing the strip coated with spheres into a solution of nickel ions, then applying an electrical current, causing the nickel to coat the surfaces of the plastic balls. Add a solvent to dissolve away the plastic, and presto! What’s left is a porous scaffold of nickel. The process is modeled after the way nature creates opals, which are formed from microscopic spheres of a substance called silica. But because the spheres in metallic wood are dissolved away, it is called an inverse opal. Like the gemstone, Pikul’s metallic wood radiates a rainbow of colors when held at certain angles, as the microscopic pores are just the right size to interfere with the wavelengths of visible light. Pikul and his colleagues have made metallic wood with densities ranging from one-tenth to one-third that of solid nickel. It makes sense that a porous metal would be lighter than a solid. But how does it remain relatively strong? The key is the small size of the nickel struts. Larger pieces of metal tend to have the occasional defects and gaps at the atomic level, sapping their strength. But in very small samples, such defects tend to rise to the surface and disappear, Pikul said. That means his nickel scaffolds are small but mighty, able to shoulder a heavy load relative to their weight. Laboratory tests indicate they have a compressive strength on par with titanium. Pikul and graduate student Zhimin Jiang now are testing the tensile strength of the material, carefully tugging it apart on what looks like a miniature rack from a medieval torture chamber. Other researchers in the field of nano-materials are taking notice, among them Timothy J. Rupert, an associate professor of materials science and engineering at the University of California, Irvine. Though it takes the Penn team a whole day to make a small square of metallic wood, Rupert said it is easy to imagine producing the material on a cost-competitive, industrial scale. One promising application would be automotive manufacture, he said. Pikul has not yet grappled with how to produce his material in such large quantities, but he looks forward to the challenge. If he could make really big slabs of metallic wood, it might even be useful as a high-tech structural component in a building, he said. It likely would be expensive compared with other building materials, but the microscopic pores could be a plus for circulating air in hotter climates. Call it an inverse opal or metallic wood: With this material, he has only begun to scratch the surface.